Sunday saw the final stage of the Vuelta a España and with it the end of the career of French rider David Moncoutié. One of my favourite riders, he was one of the rare few in which you could put a great deal of confidence in from an ethical point of view. He was a rider who rode for fun above all else, and yet his supreme natural talent won stages at the top-level during his fifteen-year career, including two at the Tour de France, and stages at the Dauphiné Libéré, Paris-Nice, Route du Sud and the Critérium International. However, he will be most remembered for his successful run of victories in the Vuelta, with four mountain classement victories putting him only one short of the all-time record. However, Moncoutié will also be remembered for his rejection of the sport’s less salubrious side. 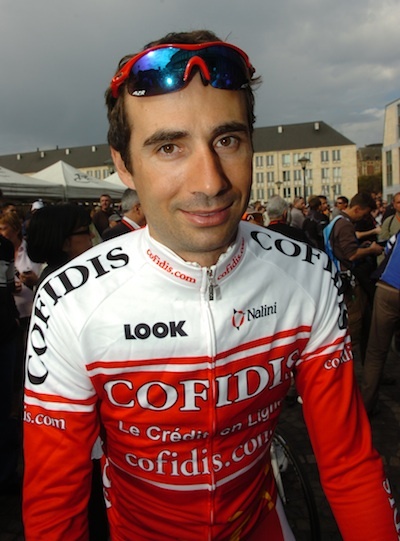 He was known for rejecting even vitamin tablets “If I want vitamin C I can eat an orange”, and using homeopathy rather than the tablets and legal recovery injections that his team would’ve used, David stood out as a rider to believe in throughout his career with Cofidis. In a team in which doping was accepted and encouraged (convicted dopers included Gaumont, Millar, Vandenbroucke, Casagrande, Lelli, Mattan, Planckaert, Peers, Clain and Sassone), Moncoutié trained alone. He was even derided by his own teammates and bosses for riding clean in a dirty era, riding in ‘the peloton of two speeds’ (a quote from Moncoutié himself). It is sad then, that we might never know what he could have achieved while he was in his prime. A 13th place in the 2002 Tour de France is his stand-out result in that race, returning to it the next year, he commented that he was “shocked” by the speeds. There is an statement from him at this blog (French) in which he reflects on his career. He talks about the serious crash and broken femur he suffered in 2007 (in addition to the nasty patellar tendon rupture a year earlier) and speaks of the “second career” which began after them, the period which took him to four successive Vuelta mountains classement jerseys and four stage wins. He mentions how his fall and subsequent abandon in this year’s Tour helped him make up his mind to end his career but says that he wanted to end it on the bike, not off. Moncoutié wanted to “shine one last time” at the Vuelta but found himself “paralysed in the descents and in the peloton”, still shaken by his crash. He round up the statement by thanking his supporters and saying that even though he left the sport “at the discretion of results”, at it doesn’t matter too much as it is just a small dent to his image. One part of the statement stood out from the rest, and it is one that sums up David Moncoutié more than any other.. It is sad to see him go, the end of an era. Farewell Moncoucou.